Andrew Lennox, general manager of Pfaff Volkswagen, is the 2014 Auto Remarketing Canada Dealer of the Year. Andrew Lennox — general manager of Pfaff Volkswagen in Newmarket, Ontario — is already a familiar name with readers as he was featured in the January/ February issue of the Auto Remarketing Canada Digital Magazine. Now, Lennox is back as the 2014 Auto Remarketing Canada Dealer of the Year. 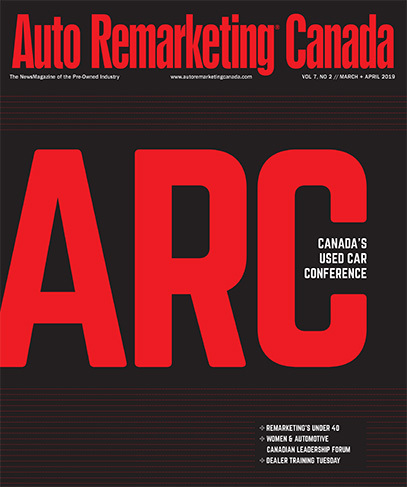 Chosen by Auto Remarketing Canada staff and our industry partners, The Auto Remarketing Canada Dealer of the Year Award, sponsored by Equifax, was presented at an award ceremony on March 17 at the 2014 Auto Remarketing Canada conference in Toronto. In response to the honor, Lennox included his team at Pfaff VW and mentors throughout his career in his accomplishments: “The important thing for me is you only get here through the people surrounding you. And I have been fortunate to be surrounded by some fantastic sales managers and service managers, and that really goes the whole way. “This really isn’t about me; it’s about the people that I am fortunate enough to work with every single day. I have always thought of myself as someone there to support rather than direct. I am a bit of a director, but I want people to know that I’m there to support them,” he continued. He also pointed out an award such as this is brought about by stellar performances from all dealership staff — sales, service, reconditioning, and more. “I share this accolade with all those who touch a used car along the way, and continue to be amazed by the fantastic volume of sales we are producing each and every month,” he said. To learn a little more about our 2014 Dealer of the Year, Auto Remarketing Canada chatted with Lennox, covering a variety of topics including why this GM first got into the automotive business. Lennox began his career in an unintentional manner of sorts. He started selling cars in 1988 at Greg Little Mazda in Richmond Hill, Ontario, and what started as a summer job quickly evolved into much more. Lennox quickly jumped up from salesman to business manager, which helped launch a career in automotive dealerships that has spanned more than 20 years. Over the years, Lennox worked with Town & Country BMW in Markham, Ontario, before working with Honda dealers for 17 years. “Looking back to my Honda days, I still think of the fantastic times working with industry leaders and dealership groups, specifically, that all had this unique knack of taking care of customers first,” Lennox said. After leaving Honda and spending six years at Roy Foss Automotive Group in Thorn Hill, Ontario, Lennox joined H.J. Pfaff in 2012. Lennox explained he had an interesting start to his job with Pfaff, taking on an overseeing role before settling into his current position. “I was initially more of a director and oversaw the construction of the Audi and VW store. I was initially there to oversee the construction; It was rewarding to build two new dealerships in Newmarket,” Lennox said. Lennox explained one of biggest reasons behind why he enjoys coming to work is the company values at H.J. Pfaff. “There are a lot of dealers out there that strive for just net profit, and then there’s dealers who grow net profit organically by taking care of their customer base. I think with the Pfaff group, I have found a group where my ethics and the corporate ethics are perfectly aligned,” he shared. Chris Pfaff, president and chief executive officer of the dealership group, is directly involved with each and every dealership, Lennox said — a boon for each store’s sales performance. “That’s fantastic because he also has a very good pulse on what’s going on in the marketplace, and it’s great to work for someone like that,” Lennox added. In fact, direct ownership involvement is not the only unique thing about Pfaff. Instead, Pfaff VW employs sales managers — who are not specific to used cars — who work directly with inventory buyers and remarketing specialists that help get inventory bought and up online. He also noted the store tries to hire a lot of young people, pulling many of its best employees from Georgian College. “We believe in hiring a lot of young people. We continually train young people on how to buy cars for the marketplace ... It’s a bit of a new process that we are working on here, and it’s working very well for us,” he explained. Not only is Lennox aligned with the dealership group brand, but he also noted the Volkswagen reputation continues to impress. Lennox also pointed out VW’s client base tends to be not only brand loyal, but also dealership loyal, as well. “I think that speaks to the reputation that the Pfaff group has in the industry and among its customers,” he concluded.